ElizabethC: I'm in CT. I have written a couple of webquests, and had my class do them. RitaZ: Im Rita Zeinstejer, a proud Webhead..., an EFL teacher and Multimedia Coordinator in Rosario, Argentina. JenniferO: Virginia and I have very little experience with webquests but very interested! JenniferO: Portugal! that is where my family is from...welcome!! JeffC just read an article in Edutopia about a school district using Webquests to move beyond NCLB... one of the Dozen Educators... anyhow... I'm Jeff Cooper, in Forest Grove Oregon and on Helpdesk here. BernieD: Got a URL for that article, Jeff? FernandaR: hi, Jennifer, where from? ChristyC left the room (signed off). BernieD waves to David. I told you I'd be back. BernieD: This is a very special Tapped In for me, as I'm hoping to learn again from the questions and feedback I get from people like you all. BernieD: This time I have some ideas that are only partly-baked and I'm eager to see how they fly when I try to explain them. BernieD: This session is going to be jammed packed, and I'm assuming that everyone here already has some familiarity with the WebQuest model. There will simply not be any time to handle questions like "What the heck IS a WebQuest, anyway?". BernieD: Since the days of the first WebQuests, the hardest challenge I've faced with my own students is to help them see ways of engaging higher level thinking skills. Many of the early WebQuests were simply worksheets on the web or scavenger hunts in which learners looked for a single right answer to a number of questions. Another large number of WebQuests were those that presented some web links and then asked learners to read them and turn them into a Powerpoint presentation. That was summarizing or retelling, not engaging higher levels of thinking. BernieD: The problem is that most of us weren't taught this way, and student teachers go out and witness classrooms that are mostly about remembering facts, mastering procedures, and preparing for high stakes tests. They don't often get to see constructivist teaching with genuine creativity, judgment, analysis or problem solving in action. BernieD: So it's no wonder that so many WebQuests were about factual recall, summarizing, and looking for a single right answer. 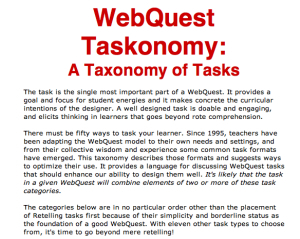 BernieD: My first attempt to respond to this problem was the Taxonomy of WebQuest task that came out around 1998 or so. VanessaGst6 left the room (signed off). KathleenFP left the room (signed off). RitaZ: have you updated that lately, Bernie? BernieD: This list was pretty useful for its time. It at least made it easier for me to talk about what we were looking for in a good lesson. BernieD: Not so much updated it but supplanted it, Rita. 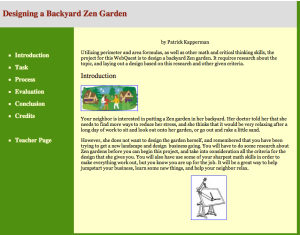 BernieD: A few years later, I developed a broader way of thinking about what a WebQuest should look like. The list of design patterns was the result. BernieD: Many of the links on that list have gone bad, I'm sorry to say, but I have new ones to replace them and will have them up soon. BernieD: Anyone have a question about either of these links? Or a comment? KathleenL: can I enlarge this chat window? ElizabethC: I have seen these before. 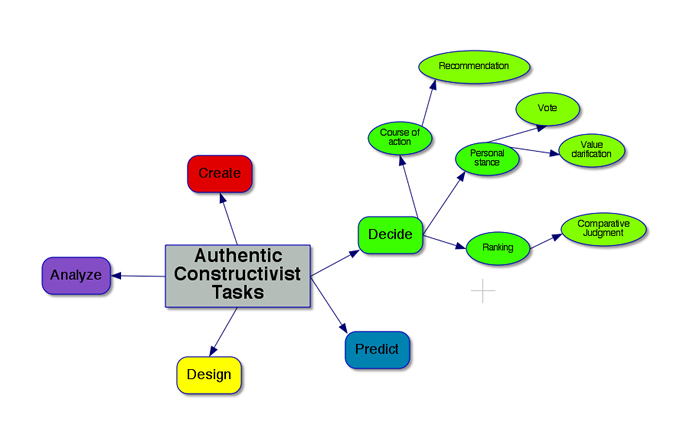 I like the way they emphasize higher-order thinking skills and give ideas for how to really do that in hte classroom. BernieD: WebQuests? Yes. But then while you're actually teaching it you don't need to prep anything. ElizabethC: I meant, these links. 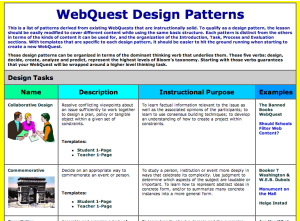 ElizabethC: It is easier to write your own webquest with these patterns that you have developed. KathleenL: OK, I am here! BernieD: Though it still isn't easy. BernieD: I believe that having these pages as guides has made it easier to create solid WebQuests, but there are problems with this list. BernieD: 1. It's not long enough. 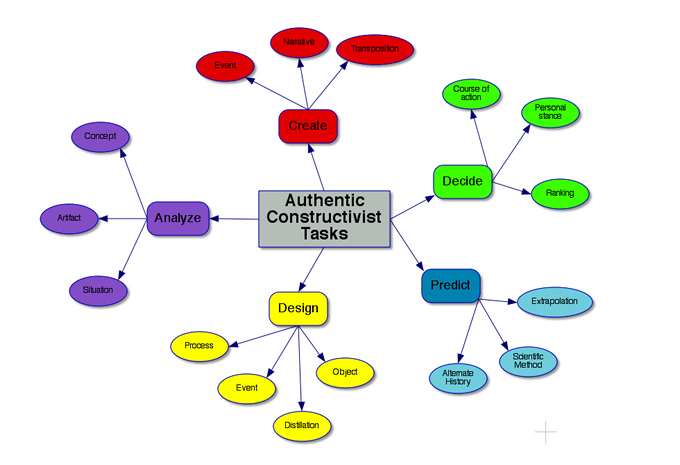 In every class I teach, someone comes up with a good, constructivist idea they'd like to implement that isn't on the list. So the list isn't long enough. BernieD: 2. There are already 26 patterns on the list, a lot more than anyone I know can keep in their head all at once. In a way, the list is too long. BernieD: Too many, too few. BernieD: The only way around this dilemma, I think, is to chunk the designs in a way that makes sense so that teachers can see the bigger picture while finding a place for their own good ideas. BernieD: The way I've decided to chunk it is by using five verbs that I think capture a lot of what we should be preparing kids to do in a 21st century environment. 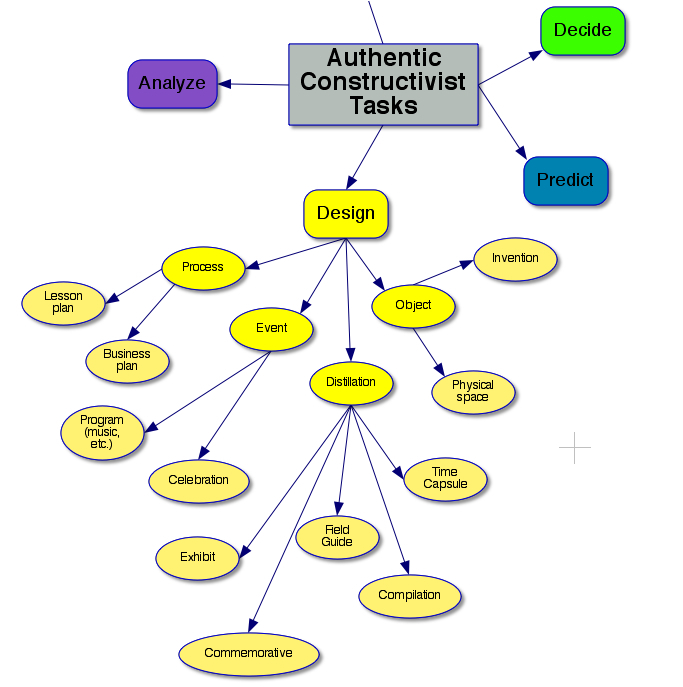 Those five verbs are design, decide, create, analyze and predict. BernieD: It seems to me that those five verbs describe what's at the heart of full participation in society as a citizen and at the heart of every intellectually satisfying career I can think of. KathleenL: ah, just figured out how to enlarge the font! 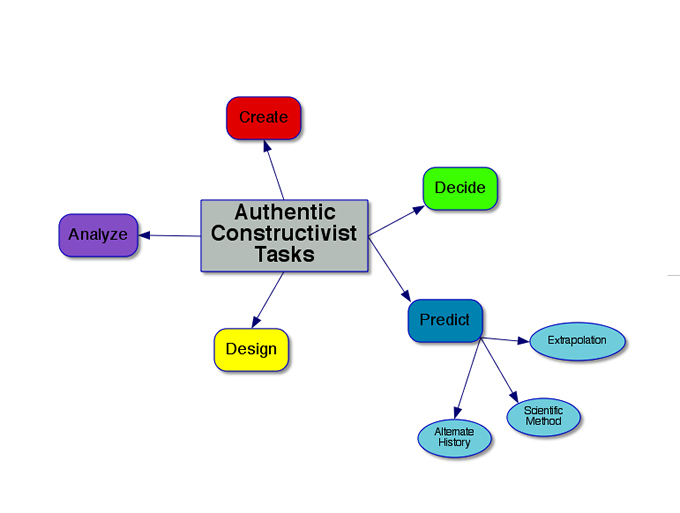 ColetteC: did you choose those words with updated Bloom's taxonomy or updated NETS*S in mind? BernieD: successful WebQuests that I've seen developed. BernieD: I first grouped those into the design patterns, and then noticed that the patterns themselves could be grouped. BernieD: There is some kinship with the new Bloom's, but not an exact fit. JeffC: how about "collaborate?" or... are we talking about individual webquests and problem solving? BernieD: And I have to confess that I haven't studied the new NETS. KathleenL: How has your Webquest design changed since the early days? BernieD: Kathleen... not that much. Just more elaborately described. BernieD: Susan... 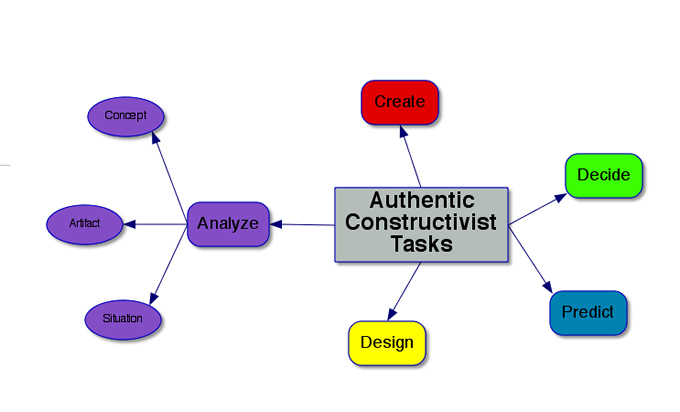 I'm thinking about Web2.0 and seeing the places where the 2.0 tools we have fit into these patterns. JenniferO: How often do you feel webquests should be used in the classroom? BernieD: And as for collaborate as a verb... seems to me that that's a means to an end (a very desitrable one) but not an example of higher level thinking. BernieD: Sure... you can create a WebQuest in a wiki, Word, Powerpoint... almost anything. ElizabethC: Web 2.0 could be used as a product for the webquest - a wki or a video, for example. BernieD: How often? Teachers tell me the most common question from their kids after they finish a WebQuest is "when can we do another one like this?" BernieD: But I think it's a once a month thing at most. BernieD: So... here's a graphic of what I'm thinking about. BernieD: Each of those five verbs has a layer of activities that one might build a lesson around. BernieD: That second level is what's new. ChristyC: I wish I could stay but lightning is too close. ChristyC: Is there any way I can what you do later? BernieD: Since you're in the Southern Hemisphere, Rita, you have to turn your monitor upside down. BernieD: Let's look at one of those layers. KathleenFP: isn't there a video part of this? BernieD: Seems to me that as the core of a lesson, we could ask kids to design an object of some kind, a distillation of information, an event or a process. 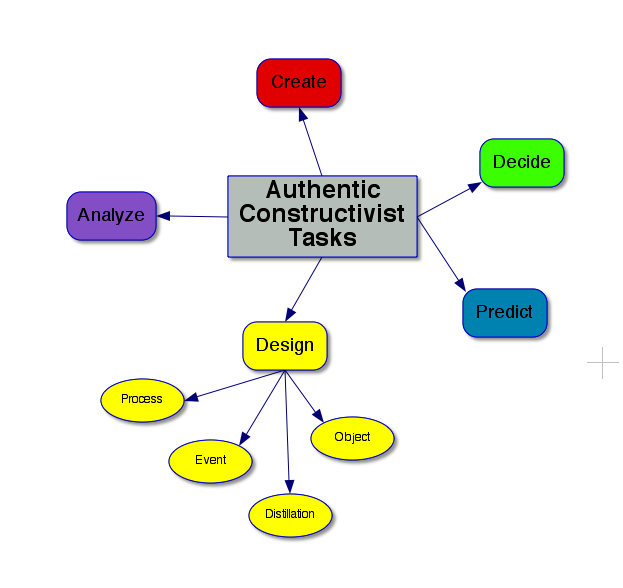 BernieD: In a design task, kids have to create a desired end state or product while working within realistic constraints. BernieD: Notice that in the Process there are limits on size and shape. JenniferO: for some reason even if I press the ctrl button it won't take me to the site? ElizabethC: It may be in the background. Look and see what other windows you have in Internet Explorer. BernieD: Hmm... maybe you'll have to wait for the transcript and see it there. JenniferO left the room (signed off). BernieD: So... in the new (still developing scheme) the old design patterns and some new ones are organized under these categories. BernieD: Everyone else able to see the links? Any comments or questions? KathleenFP: Is there a audio portion? KathleenL: so in this model there are more specific details required? BernieD: No audio, though you can feel free to read the words aloud to yourself. JeffC: links clicked here open in a new tab or window... subsequent clicks go to the *same tab or window*. AnaliaD: Berni, this design reminds me of the TfU framework? Was that a source of inspiration? BernieD: Kathleen.. the new model allows (I hope) teachers to think broadly about the kind of thinking they want to develop, and then go into more detail about how they'll do that. Each design pattern will include very specific guidance about how to implement it with links to example time capsules, for example, and hints on how to help learners select what goes into a time capsule. BernieD: TfU was a source of inspiration in the very beginning, Analia, though I've found it hard to teach using that framework. ElizabethC: Have you written the analyze portion yet? That is a skill I want my students to work on. AnaliaD: it is that's why I was wondering; i see this is much more feasible! BernieD: It stays too long at the abstract level and most teachers want to head down to the concrete details right away. BernieD: let's look at another of the verbs. BernieD: It's an example of analyzing artifacts... things created by people like literary genres. BernieD: How so, Kathleen? I think almost everything you could come up with will end up somewhere on this chart, and if it doesn't I'll try to make a new place for it. BernieD: Yes, that would be a good lesson. KathleenL: I think that is the part I am struggling with, everything must have a place. Where do the kids define the outcome? AnaliaD: Bernie, does that mean there are different entry points? BernieD: Could be. Or more options at the exit point when kids figure out how to make something that solves the problem, answers the question, etc. It's up to the teacher to figure out how much structure vs. freedom to allow. JeffC wishes that the Resources and Rubrics links were not Word docs... but such is life. BernieD: Remember that a WebQuest isn't open-ended inquiry. It's not Summerhill. 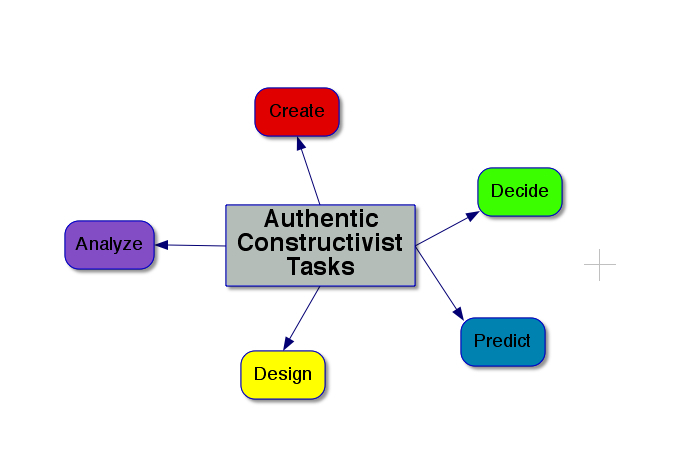 It's a guided form of inquiry that some kids (and some teachers) can use to get themselves ready for open ended inquiry. BernieD: I can see that we're running out of time fast, so let me quickly show the other sections. 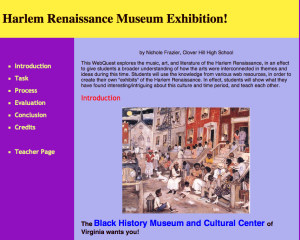 BernieD: And an example of a creation-based WebQuest Harlem Renaissance Museum Exhibit! 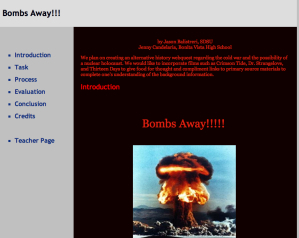 BernieD: And an example WebQuest: Bombs Away!!! 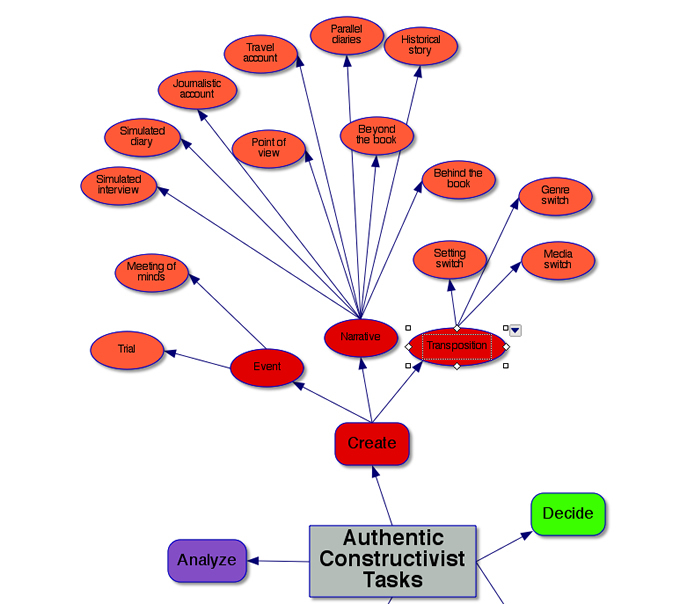 ColetteC: Will you create a new scaffolding for your webquests to include the new verbs? JeffC: Nichole Frazier needs to do the rubric and also credits for her Harlem webquest. BernieD: Collette... yes. Already doing it on my QuestGarden site. AndreaBla left the room (signed off). ElizabethC: It seems to me that some of these verbs could be combined into one webquest - using an analysis to predict, for example. KathleenL: Bernie, can you show us results in the classroom? I would love to see the products that kids create! JenniferO: have to log out now but thank you for the excellent insite into webquests! BernieD: Yes... a lot of things will end up as a combo. 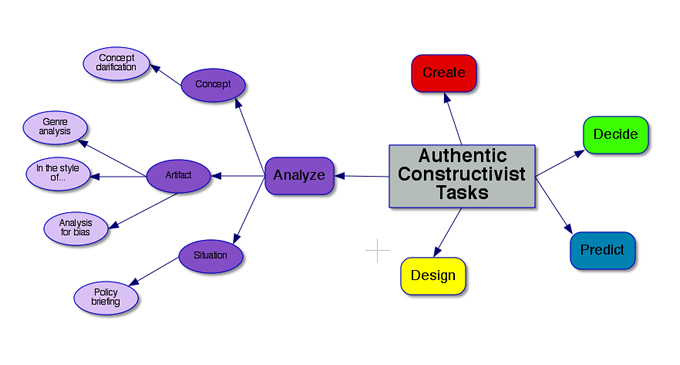 Pedagogically, sometimes I think it's better to focus on one thinking skill at a time for awhile. BernieD: These aren't my WebQuests, Kathleen, so I don't have student products. 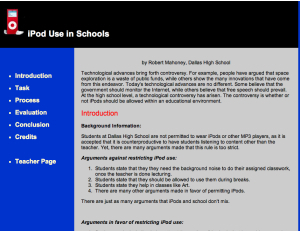 I'm encouraging teachers to add links to student products in the teacher pages, though. BernieD: So... the bottom line... here's the new scheme in graphical form. BernieD: Thanks for the link, Collette... looks interesting. KathleenL: that would be powerful! BernieD: Jeff has a link to the edutopia article he mentioned. JeffC: that's how you can search for webquests... and yeah... that's from the "Daring Dozen" at Edutopia. JeffC: If you don't subscribe to Edutopia magazine... you should... it's free. JeffC: Kathleen, you mean student projects that came from webquests? 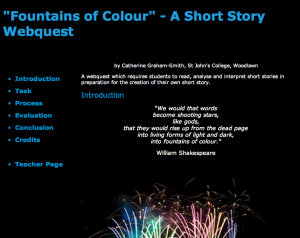 ElizabethC: Can teachers add webquests they have written to questgarden? BernieD: I can hear a bunch of drunken Shriners outside the conference room door trying to get in for the next time slot, so it's time for final questions and comments. BernieD: They can submit them to the webquest.org listing, but the ones in QuestGarden are created in QuestGarden. JeffC: some teachers may post results... some may have online projects, but oftentimes webquests don't have digital results. BernieD: Right. They don't need to. AndreaBla: in my experience, some of the best webquest products are not created using tech at all...poems, mural, collages, etc. BernieD: I'll redouble my efforts to have teachers link to student products. BernieD: Even the collages can be photographed. BJB2: Thanks, Bernie. Great to have you stretching my brain! AndreaBla: Thanks Bernie! Hope to catch you at a conference soon! AnaliaD: Thanks Bernie, thanks for for kindness, open-mind and for stretching our thinking skills!!! BernieD waves to all and hope to see some at NECC. KathleenL left the room (signed off). BJB2 left the room (signed off). RitaZ left the room (signed off). FernandaR left the room (signed off). BernieD left the room (signed off). Comments and suggestions are welcome. Write to bdodge@mail.sdsu.edu.